As we all know the worldwide famous 2016 UEFA European Championship or simply Euro 2016 will be start in France on 10th of June and finish on 10th of July 2016. And, of course, a lot of people become concerned already by now about where to get the full schedule with all the participating teams. With free Excel spreadsheet you can track the schedule of all games in this tournament. This spreadsheet can automatically calculate the position of every respective football team in accordance with earned scores and UEFA regulations and generate the schedule of upcoming games. 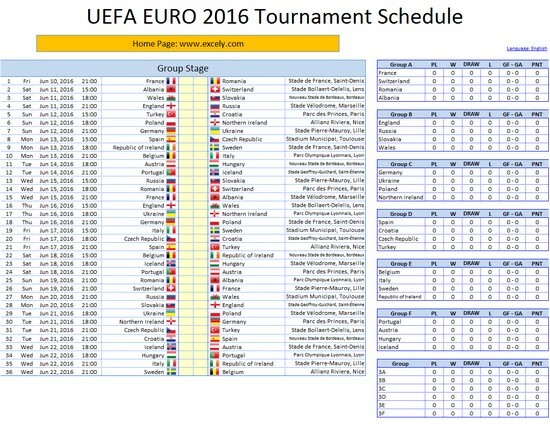 Hence all the football fans can keep track of Euro 2016 tournament. Feel free to select from multilingual interface (36 languages) and different time zones the ones that match your requirements. With UEFA EURO 2016 Final Tournament Schedule you will definitely enjoy the upcoming tournament in a very convenient manner!